ProFx is a unique forex trading strategy, also called Metatrader Expert for forex day and swing trading. This forex trading software is a must have tool for advanced trader who wants to make real and serous profits trading forex. 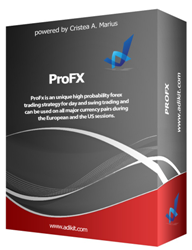 ProFx is an unique high probability forex trading strategy for day and swing trading and can be used on all major currency pairs during the European and the US sessions. The trading rules from the system are clear. ...... 00/2.00 makes this forex trading strategy to a "must have" forex system for every forex trader who wants to make serous profits trading forex. You don't need to be a Metatrader Expert, in fact no special knowledge is required because ProFx is very easy to use. Installation and setup is done with a few clicks. Trading signals appears directly on your screen and the system supports also Audio, SMS and Email alerts what makes the handling very comfortable and is reduced the monitoring time to minimum. Weather you are completely new to forex trading or already an professional trader who trades for a living, Profx will help you to increase your profits dramatically and save you a lot of monitoring time. Qweas is providing links to ProFX 1 as a courtesy, and makes no representations regarding ProFX or any other applications or any information related thereto. Any questions, complaints or claims regarding this application ProFX 1 must be directed to the appropriate software vendor. You may click the publisher link of ProFX on the top of this page to get more details about the vendor.